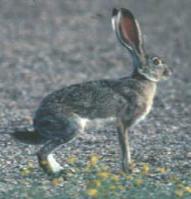 Although it is called a rabbit, the black-tailed jackrabbit is really a hare. Hares are different from rabbits because their babies, called leverets, are born with all their fur, and their eyes open. Jackrabbits live in the extreme environments of the desert and chaparral, where temperatures are hot during the day and cold at night, and there isn't a lot of rain. open areas where they can see predators coming. With its long, rangy legs it can run in bursts of up to 36 mph. Their incredible speed helps them outrun many of their enemies. The soles of a jackrabbit's feet are covered with fur. This cushions their feet on hard ground and insulates them from the scorching heat of the desert sand. Their fur is a silver and tan color that blends in well with the desert and chaparral habitat that it lives in. Male jackrabbits can weigh from 9-11 pounds, and females 11-13 pounds. As you can see from their weight, female jackrabbits are larger than males. They can be anywhere from 16-28 inches, with a 2-5 inch tail. They reach sexual maturity in 1 year. After mating, the female, or doe, will have a litter of 1-6 leverets every 3-4 months. The mother will leave the leverets in separate hiding places, and come back in the evening to nurse each one. After one month they are on their own. Jackrabbits aren't picky eaters and can eat tough grasses, leaves, and twigs. They will also eat sagebrush and cacti. They only come out at night to feed. They conserve water by eating their food twice. This is kind of gross, but when they poop out their food the first time, they will eat the poop and digest it again, getting even more of the moisture out. Jackrabbits rarely have to drink and get most of their water from the plants they eat. Fifteen jackrabbits can eat as much as one full-grown cow in one day. The jackrabbit is common in the western United States and northern Mexico, and in many places is considered a pest. People put up fences and poison to try to control them. "Black-tailed Jackrabbit". Wildlife Explorer. USA: International Masters Publishers, 1998.